This article, by the firm’s president, Tom Merrell, AICP, was originally published on the APA national website from 1998 to 2009. It is reproduced here inasmuch as the principles remain unchanged. Outsourcing is becoming a way of life for many municipal planning departments that are serious about maintaining a streamlined and responsive service level in the face of a large backlog of work. The solution is what is called an “on-call” consulting services contract. It obligates the consulting firm to respond to work assigned on an as needed basis. Where the consulting firm’s staff is experienced in a broad scope of city planning services, it will offer a team that integrates seamlessly into the department operations. This not only gets the work done, but adds significant depth to the city’s resources and creates an effective and positive work environment, free of potential conflicts of interest. Contracting with a full-service firm frees up the workload of the in-house staff to concentrate on the things best done by municipal employees, saving both time and money. In most cases, outsourcing is used to augment the planning department staff. Municipalities that have a program for regular use of on-call consultants maintain a core staff that ensures appropriate service levels when the workload is at minimum, as well as maintaining institutional continuity. On-call consultants are used to handle the peaks in workload, usually generated by a high level of development activity. Consultant fees are usually covered by charging applicants an hourly rate fee that covers the consultant’s time plus an administrative charge to cover contract administration. The beauty of an on-call contract is the availability of the consultant to provide any service that may be needed from time to time, yet it carries no obligation for the agency to assign any work or incur any financial obligation if it can handle everything in-house. The consultant’s services are responsive to the agency’s needs and customized to fit the department’s operations and policies. There are occasions where the planning department is led to use the services of independent contract employees as a staff resource. This is sometimes the best option, and can realize a cost saving to the agency. Some agencies have had to abandon this concept, however, because of Federal or State rules limiting the number of hours that contract employees can work, entitlement to benefits, or other employment issues. In other cases, municipal requirements for professional liability insurance, which is very expensive, can neither be waived nor provided by the independent consultant. A full service consulting firm can meet the requirement for insurance, and is staffed by bona-fide employees that receive a complete compensation package, including benefits. In addition to offering a wider range of resources (such as internet technology, graphics, computerized tracking systems, etc. ), these firms contribute to the continuity of the on-call staff in the commitment and stability of their own employees. And in certain instances, agencies that wish to retain the services of a particular individual (sometimes a former employee), the consulting firm may offer them a position and place them in the department. A full service consulting firm not only provides specialized services to do the planning work, but brings with it a fresh outlook for problem solving as well. As a by-product of outsourcing, the planning department enjoys the added depth of experienced principals in the consulting firm that can bring a unique perspective to old problems, and the application of technology often not available in most jurisdictions. Further, within the scope of the contract and in a very timely manner, the consulting firm can sub-contract to other specialized professions, such as computer technology specialists, design professionals, etc., to increase the scope of services that benefit the city. The consultant team of a full-service consulting firm can manage a large quantity of diverse projects and be responsible for each project through the entire planning process. A principal or manger assumes the responsibility to supervise its own consultant staff and assure quality and timeliness. A senior level planner is the project manager, but will be supported on the project by subordinate personnel that can be assigned routine tasks at lower billing rates. This ensures the optimum efficiency and the minimum cost. The work products can be reviewed by the firm’s senior planners and planning manager, reducing the workload of in-house supervisors. Customized project tracking systems can be developed by the consulting firm for the agency to account for project status and cost. Many consulting firms offering urban planning services do work for private sector clients. If these firms are used by a public agency, there must be an openness about who their other clients are and a mechanism to disclose and manage potential conflicts of interest. The most obvious issue is where the consultant is doing work for a developer and also processing development applications for the agency. In some cases, public agencies only require that the consultant cannot review applications submitted by its developer clients. In other cases, the agency may have a policy that the consultant cannot provide services to any landowner or applicant within its jurisdiction. This policy may apply even if the work for such a client involves another jurisdiction. Every community has their own level of concern. It is very important for municipal managers to clearly convey the level of concern and policy guidelines to prospective consulting firms during the selection process. This may take the form of including a provision in the consultant’s contract that the consultant must have written approval to provide services to landowners or developers within that jurisdiction. Or, it may be simply controlled by maintaining a short list of on-call consultants, giving the agency an alternative of assigning work to another consultant to avoid an appearance of impropriety. Of course, the simplest solution is to contract with consulting firms that limit their practice to public sector work. When used to its ultimate, outsourcing will establish a commitment by the consulting firm to accommodate the fluctuating workload demands on the department. In a sense, the on-call consultant serves as the “fire brigade” for its client cities. They are called upon to deal with everything from small brush fires to major conflagrations. This wide range of service options include substitute planners during vacations, sick leave, etc., handling specific assignments (e.g. an initial study and ND), managing the process for a major annexation, GPA or re-zone, or fully augmenting city staff functions. Municipal planning departments that have used this approach successfully have been able to maintain consistently high service levels with a core city staff, using on-call consultant staff to handle peak workload demands and special needs or projects. As an alternative to hiring more employees, outsourcing is an excellent solution to an overloaded planning department. As more consulting firms make this service available as a well organized focus of their practice, its use will become more common-place and comfortable. Getting started is always the hardest part. The best place to begin is deciding what service levels are in need of improvement and the type of work that can be assigned to a consultant. The selection process should be based on qualifications, leaving the details of the service delivery program, and integration of consultant and city staff, for discussions with the finalists or the firms under contract. The table on the following page summarizes the issues associated with each level of service when considering an outsource program. As technology and evolving attitudes towards employment by younger generations of professionals change the service delivery landscape for municipal service providers, the lines between consultant staff and employees will become less distinct. It is now possible for everyone and anyone to set up a fully functional office at home, with incredible facilities for communications and work product output. The sooner public administrators embrace innovative ways of thinking about old problems and experiment with new solutions, the more exciting the transition will be. And the ultimate beneficiaries will be the businesses and citizens of our communities. Certain types of planning functions work best where the consultant provides long term assistance. In those cases, the length of the contract term and city funding must take this into consideration. The consulting firm must have the depth to assure a long-term service relationship. Generally, consulting firms that employ professional planners with extensive public agency experience, providing competitive wages with full benefits, can best assure control of staff priorities and maintain a consultant work force that is stable. 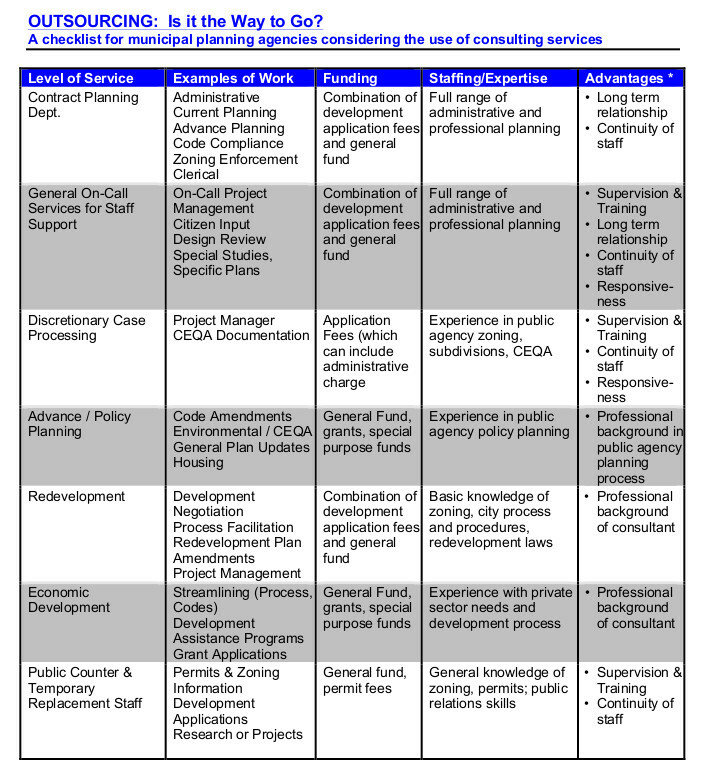 In contracting for planning services, consider who has the burden for supervision and training. In some cases, the scope of services warrants making this the responsibility of the consultant firm. In other cases the public agency must be prepared to manage the time and priorities of its consultant planners. Availability of staff when needed, ability to meet deadlines and capability to deliver work products in format, time and place required by the municipality are critical to certain planning functions. Consultant staff must have the combination of qualifications and understanding of the governmental process required of city or county staff. Ideally, the consultant’s professional background should include extensive public agency experience as well as a willingness to work for the public good and the betterment of the community. Such qualities help ensure a seamless integration into the operation of the Planning Department because the consultant staff has the same vision and overall purpose as the municipal agency staff. Consulting firms that limit their clientele to public agencies ideally avoid potential conflicts of interest. Those firms that provide consulting services to private sector clients avoid conflicts by limiting such work to projects that do not involve sites or land owners within the contracting jurisdiction. Consultant fees can be negotiated to fit the source of public agency funding. Case processing and review of development applications often require responsiveness to input that is out­side the consultant’s control, and is therefore best compen­sated on an hourly rate basis. Where applicants pay the munici­pality an hourly rate fee for processing, the applicant’s fee can be a combination of the consultant’s hourly fee plus an addi­tional amount to offset the city’s cost to administer the contract. Where the work is under the control of the professional, a fixed fee can be appropriately used.